Acoustics is an essential consideration when designing or renovating a church or other place of worship. Well designed church acoustics have the power to elevate the spiritual experience, while poor acoustics can dilute the power of religious music and ceremony be it church, synagogue, mosque or other religious space. Aesthetics are also critically important, with natural wood veneer finishes, often providing a fine contemporary finish. 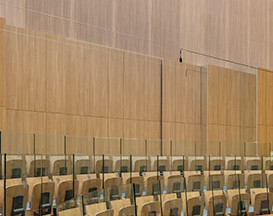 Woodfit have provided premium church acoustic treatments for several such spaces including those shown below.